Last fall, Martin-Fontana Parks Association (MFPA) sent electronic surveys to MFPA members by email, and to the NextDoor neighborhood sites surrounding the parks. Seventy-eight were returned and tallied showing the following priorities for TJ Martin and Jeffrey Fontana Parks. Top priority was protecting trees by trimming them, removing dead and dying trees and replacing them. This aligns with the MFPA mission statement. We continue to monitor and work with PG&E and have introduced a tree trimming program with the Parks Dept. Next on the list was addressing the turf problems caused by rodents and the aging irrigation system. Sprinkler heads are constantly clogged from rodent digging and valve wires being chewed. The irrigation system is 30 to 40 years old and many of the main valves need replacing. This combination leads to a dangerous turf surface for park users. The parks’ rodent control program for the last few years has consisted of trapping and removing rodents. This inefficient program will not eradicate the population, which must be done before turf refurbishment can begin. MFPA has met with City Park managers to explore the alternatives to rodent control and push for a better solution. Parks, Recreation and Neighborhood Services (PRNS) is currently testing other methods in other parks that may be implemented this year. Also in the top set of priorities was continuing to plant and mulch barren dirt areas. To support more planting and reduce the amount of time to hand water plants, we are exploring irrigation options. Listed below are the Projects for 2014. …who is making unauthorized removals of branches from our Heritage Trees. Did anyone see someone cutting branches off the Oak Trees near the south entry to The Villas of Almaden over the weekend of the 1st & 2nd of March? 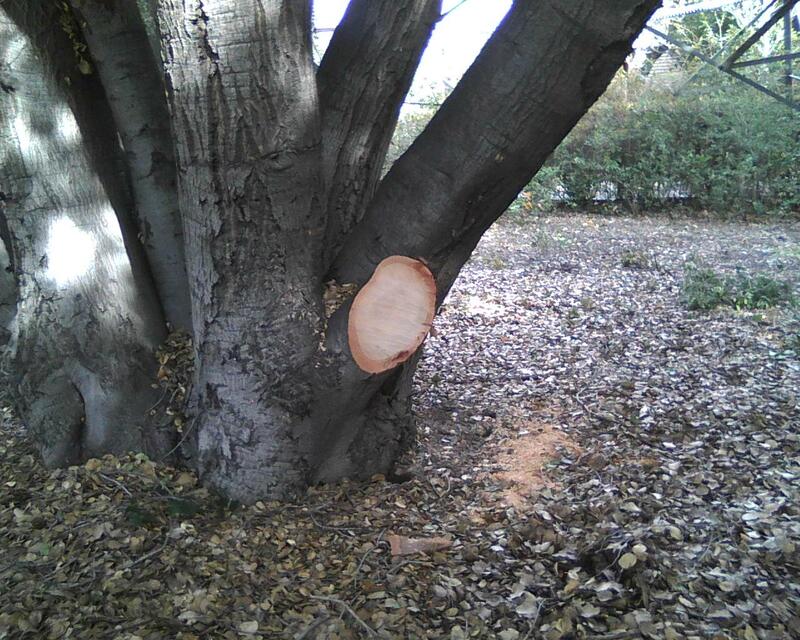 Parks employee, Louie Anaya, discovered a large limb had been removed on Monday. He thinks it may have happened over the weekend. The fact that the cut looks like it was done professionally and that the limb was taken, suggests that it was being taken for a purpose other than just someone doing some pruning for the benefit of the tree. Now that the trees have been nicely pruned by PRNS, the beautiful trunks are very visible and are unfortunately now exposed. We are very concerned that this might happen again. 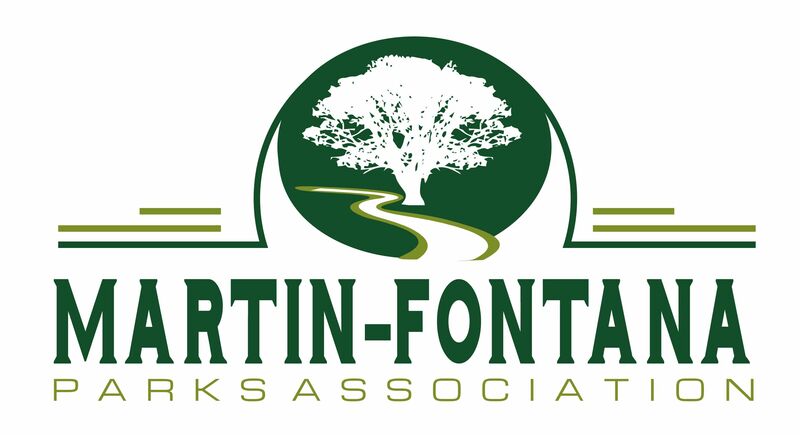 If you see any unauthorized person removing tree branches, other than PRNS employees, could you please contact the Martin-Fontana Parks Association with the information? Reporting it will give us a better idea of when it might have been done. We can be contacted via email at SaveOurParkTrees@gmail.com. Your cooperation is greatly appreciated. Click on Newsletter for pages 1 thru 4. 2011: A Year of Accomplishments! 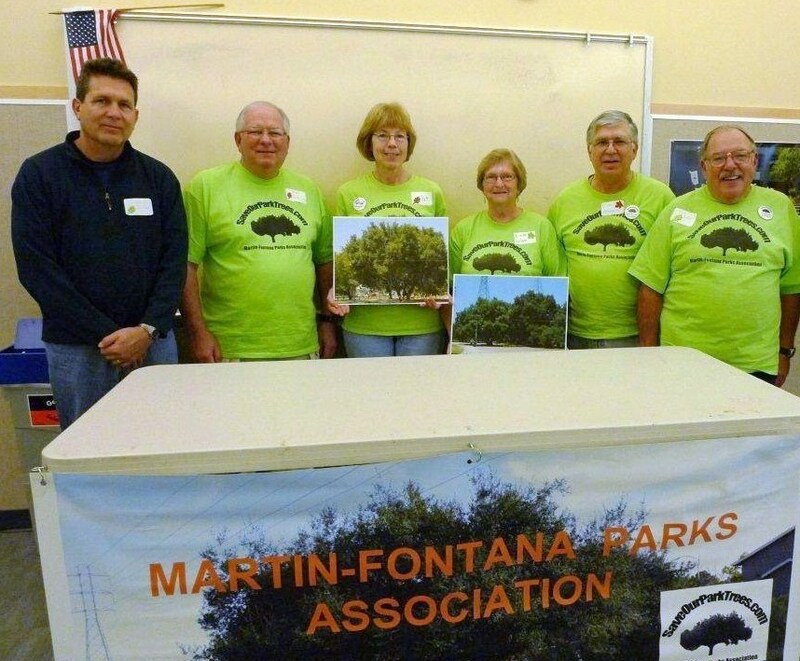 Thank you for supporting Martin-Fontana Parks Association as a member and with your sponsorships and donations. We also thank all of you who had the time to come out and actively volunteer in our planting and clean-up projects this year. We now have over 50 community members who have become Adopt-a-Park volunteers to work in our neighborhood park. January 2011: MFPA began negotiations with PG&E on their list of 26 trees slated for removal by the end of February. We successfully narrowed the removal list to four mature trees and three saplings along the Villas fence line, for a total of 7 trees. Others were trimmed or placed on a “watch” list for 2012 evaluation. January 2011: MFPA held its first General Membership meeting and elected its first Board of Directors for 2011-2012. 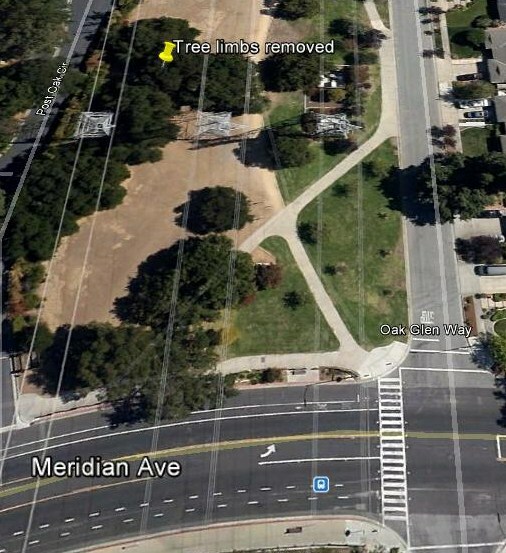 May 2011: Using $1500 from PG&E funds for tree replacement, we planted 18 new 15 gallon trees in agreed upon areas of TJ Martin Park between Coleman and Meridian. Our agreement with PG&E has stated that for every tree they remove, they will reimburse MFPA $75 for tree replacement or restoration of the area. June 2011: As part of the Lucky Shares Program, we distributed Share Cards in the community to Lucky shoppers. To date, we have received nearly $500 from the use of these cards by our supporters. July 2011: The Restoration Committee completed a three to five-year Master Plan for restoration and enhancement projects in the parks. August 2011: “Heart of the Park II” raised $1700 from new memberships, member renewals and the raffle donations. Your membership does count as we work with the City and PG&E to preserve our trees and enhance our parks. 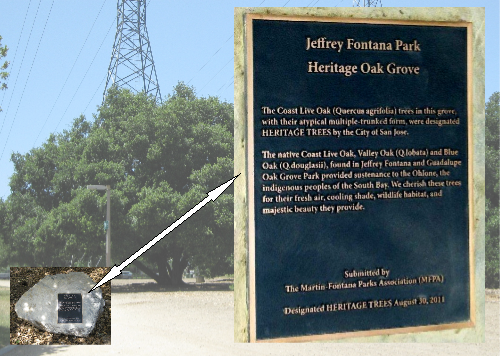 September 2011: In June 2011 MFPA met with the City Arborist, asking that a grove of multi-trunked oaks in Jeffrey Fontana Park be proclaimed a “Heritage Grove” and placed on the City list of protected Heritage Trees. The City Council voted to do so in September and MFPA will raise funds to place a permanent marker near the Grove. 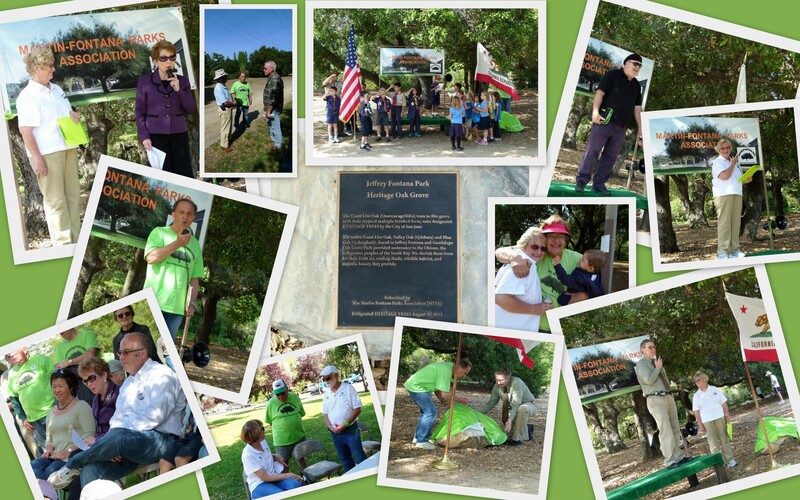 October 2011: Two restoration projects were completed in Jeffrey Fontana Parks. The first was Island A, a native CA plant area designed to enhance the bare dirt area west of the dog park – an area under the power lines where we are restricted and cannot replace trees. The second was planting CA native plants from the tot lot east to Golf Creek on the east side of McAbee. Nearly $2500 of your donations was used to fund this effort. 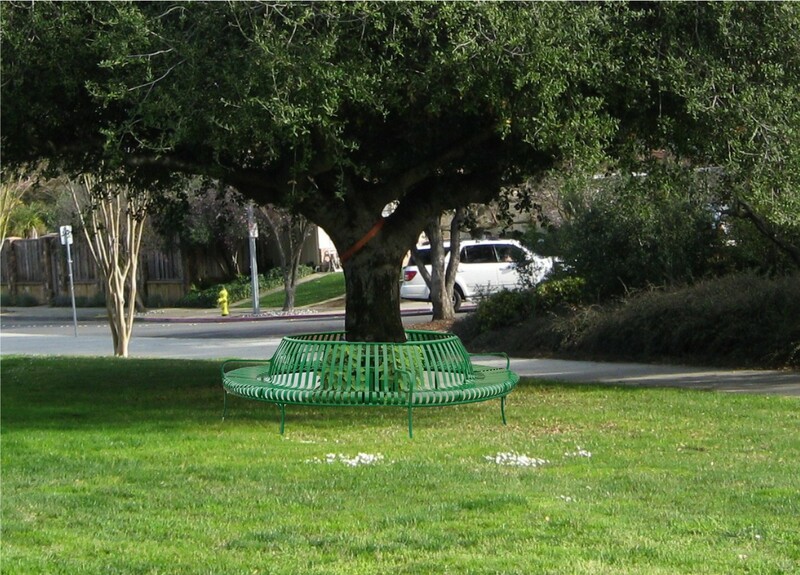 November 2011: Martin-Fontana Parks Association received a formal commendation from the San Jose City Council for our efforts to save our mature trees and enhance and restore areas most affected by PG&E tree removal. PG&E has already sent a crew out in the parks in early December to evaluate the trees for removal and/or trimming by the end of February. Our negotiations team is preparing to meet with PG&E in the next two weeks to begin 2012 discussions with PG&E. 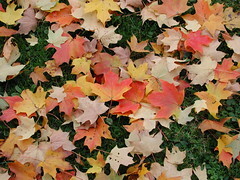 We will be actively working to promote trimming of all trees with no more removals. We have already lost 16 trees in the parks over the year from disease and storm damage. Join us on January 7: The Board of Directors and Restoration Committee are hosting a “Community Walk Through” of TJ Martin and Jeffrey Fontana Parks. We are looking at areas that need improvement and locations where trees may be planted to replace those removed by PG&E or lost to disease or storms. We have heard from some park neighbors about projects they would like us to consider. We want to hear from you, too! Join us at 9:00 in TJ Martin Park between Weimar Ave. and Fleet Street. We will walk eastward toward Meridian and note down your ideas of areas which need attention. At 10:00 we will cross Meridian and walk Fontana Parks from Meridian to Almaden Expressway. 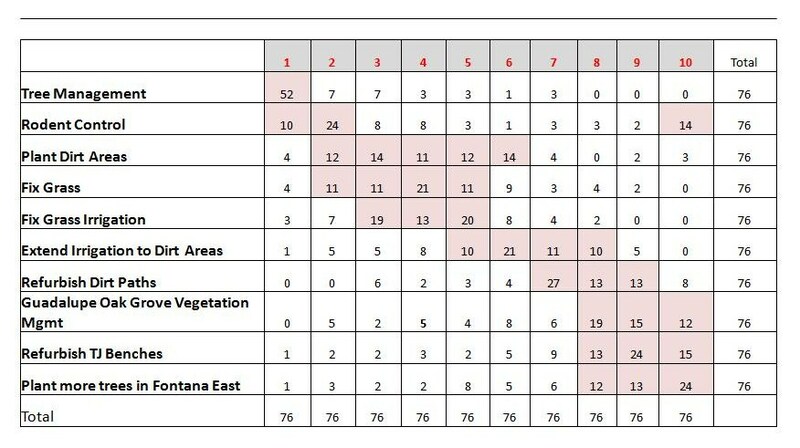 From this assessment and your comments, we will build a project list for 2012 to be prioritized and budgeted. January 2012: The second General Membership meeting will be held Saturday, January 21st at the Villas from 10:00 to 11:30. All members are invited to attend to hear an update from the Negotiations Team, discuss projects to be considered in the parks for 2012, and elect four members to the Board of Directors. Nominations for the * terms are still open. Any member who would like to become a member of the Board of Directors is invited to call Pier Maggianni at (408) 410-5166 to have your name added to the ballot. Please do this before January 14, 2012. Property Damage: MFPA has heard from several park neighbors who are having an ongoing problem with property damage caused by ground squirrels and gophers. These pests are migrating from the park into adjoining neighborhoods. Three people in the TJ Martin Neighborhood area have suffered over $500 of landscape damage in their yards. If you have also experienced problems, please contact Linda Wilson at ronald_m@comcast.net. If we have a significant number of complaints, MFPA will arrange a community meeting with our City Council Member Nancy Pyle and the Parks Department to try to reach a resolution to the problem. October 15th Planting Project – Help Needed!!! City Council declares grove in Jeffrey Fontana Park a “Heritage Grove”. Plans have begun to save Tree 13 from PG&E removal. MFPA introduces PayPal account for donations. Lucky Shares cards provide funds for MFPA. Produce Share at Jeffrey Fontana Park on Oct. 15th near children’s play area.